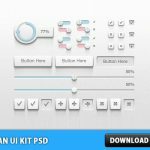 Download User Icon Free PSD. This is set of user icons: 4 women and 3 men. These icons can be used in different areas. Might be useful for profile applications, avatars, lists as well as for forums and blogs. Feel free to use them in any commercial or personal project. The images made with vector shapes, so you can scale to any size without loss of resolution. The .PSD file is well hierarchy and ready to adapt with your needs. Enjoy!